After being swept by Minnesota State, the Terriers slipped to #7 in the USCHO weekly poll and to #8 in the USA Today/USA Hockey Magazine poll. ESPN’s John Buccigross has BU in the #9 spot. ►Freshman Shane Bowers earned a spot on the Hockey East Weekly Top Performers list for his two goals in Friday night’s game. Blog contributor Neal Boudette provides the Takeaway from Sunday’s loss to Minnesota State. For the Terriers this weekend, it was “Welcome to the AHL.” They dropped two games to Minnesota State, and it was an eye-opener on the realities of college hockey. They lost to a team that was older, stronger and more mature. Much older. At times it was men against boys, literally. On Saturday night the difference was clear. When the game was open and flowing, BU was the better team, skating, moving the puck, using its speed and creating shots and scoring chances. In the first, BU outshot Minnesota State by a wide margin. The unofficial tally was 12-4. But as the pace of the game slowed, and there were more physical battle along the boards and around the net, Minnesota State’s roster of 22, 23 and 24-year old players had the advantage. That’s what happened in the second period, when the Mavericks dominated the shots and scored twice. Here are some other facts: BU has 14 players on its roster who are 19 or 18 years old. Minnesota State? Just one -- – freshman Walker Dueher, from Sioux Falls, South Dakota. BU has four players who are 22 or older. Minnesota State has 12. Their roster read like an AHL team’s – the birth years are ‘94, ’95, ’96. BU is heavy in ‘98s and ’99s. At times 18-year olds like Logan Cockerill and Cam Crotty were going up against guys five years older. The result was that BU’s smaller skill players were neutralized most of the night. Patrick Harper barely made any plays except for a few nice passes on power plays. Ditto on Hank Crone. A couple bright spots for BU: freshman defenseman David Farrance showed the skating ability that made him a third-round draft choice. Twice rushed the puck from the BU zone, carried it over the blue line and created scoring opportunities. Cockerill’s speed continues to impress. Jake Oettinger was excellent in goal, again. Shane Bowers was very good on faceoffs. Jordan Greenway caused havoc around the Minnesota State net. He needed help though. Despite BU dropping 2, it's not reason for panic. I still like this team and think they can go far. Frozen Four is not farfetched. They have high skill and speed. They are a little short on size and strength. If they learn to keep up their speed game and intensity, they could beat a team like Minnesota State later in the season. This coming weekend against UConn is a key test. Can they bounce back? We'll find out Friday night. More comments on newest recruit Donovan Sebrango. Evan Rodrigues remains out of the Sabres line-up with a hand injury. 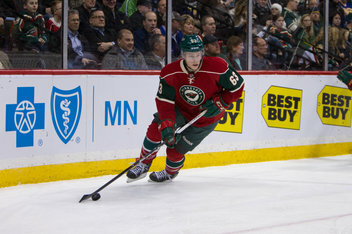 Joining him on the injured list is Charlie Coyle (photo), who suffered a broken leg in Thursday’s Minnesota-Chicago game. The injury ends Coyle’s franchise-record of 316 consecutive games. He’s expected to be out from six to eight weeks. Kevin Shattenkirk scored his first goal as a New York Ranger on Saturday, but the Blueshirts fell, 3-2, to John Hynes' New Jersey Devils. Tara Watchorn, a four-year standout on the BU blueline who would go on to play on the Canadian national team and the CWHL Boston Blades, has retired. She won a gold medal in the 2014 Olympic games and silver medals in the 2015 and 2016 World Championships. Congratulations and all the best, @tweetintara27.